Launched in 2007, the Executive Hire Show has quickly become the UK's major trade show for the rental of industrial tools and equipment. This annual event brings together both renters and suppliers to present their latest innovations. This will be the third year of presence for MAC3 at this event. Find MAC3 on February 6 & 7, at the Coventry Hire Show, location A50. The ARA Show is the annual conference and trade show of the American Rental Association for the sector of the rental of materials and equipment for the field of Construction. 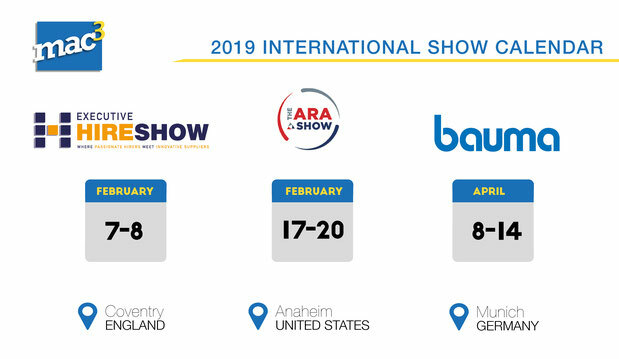 This show, gathering more than 700 exhibitors, will be from February 17 to 20, 2019. MAC3 will be present at this event through its American subsidiary, MAC3 Inc. It will be a great first time as an exhibitor for MAC3 Inc.
BAUMA is the essential trade show for experts in the construction sector. This event is the meeting place for the main international players. It is also in Bauma that the latest innovations in construction are presented. As was the case in 2016, MAC3 will obviously be present at the 32nd edition of this world reference trade fair for the construction sector. Appointment from 8 to 14 April 2019 in Bauma !